New galvanized window screen installed! Ongoing maintenance is something that every business owner, home owner, and even landowner needs to do! 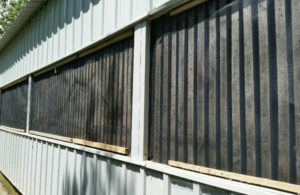 This summer at SOAR, the ‘hawk house’ had new galvanized window screen attached to the exterior of every open window on a flight pen. Why window screen on flight pen windows? We try to give our recovering patients every advantage and the screen helps to keep out mosquitoes and other flying insects. Insects can be a total nuisance and the mosquitoes may carry West Nile Virus. Check this CDC document for an explanation of the West Nile Virus life cycle. Emily and Caitlin installed new window screen. Thanks so much! 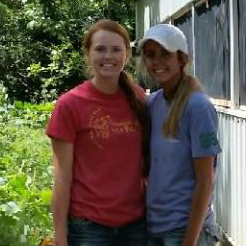 SOAR’s intern crew is very small this summer – so when Diversity Farms plant staff have time, they help out. Also new this summer is an updated outside weathering area in the lawn where Thora and Decorah can both enjoy their own bathing pools! You can see that the top of the weathering area is also secured with panels as a visual barrier for anyone flying the property! 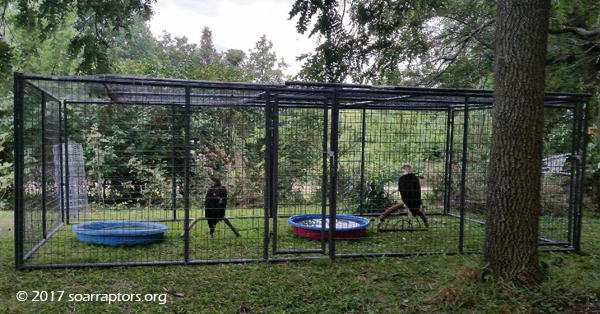 This allows for both eagles to fully experience the weather and have company. Decorah and Thora share a weathering area, but not pools! Each can only get to their own pool.